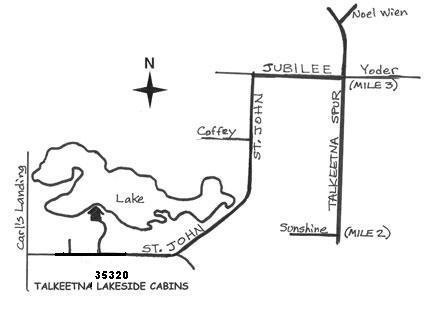 Contact Talkeetna Lakeside Cabins with any questions you may have about your stay in Talkeetna, Alaska. At mile 99 of the Parks Highway between Cubby’s Marketplace and Sunshine Tesoro turn onto the Talkeetna Spur Road. 3 miles up the Spur road turn left on Jubilee Drive. ½ mile down Jubilee Drive turn left on S St John Drive and continue for another ½ mile to TLC on your right. Wayne Woller and Holly Stinson invite you to share this peaceful setting.